Now in its’ fourth year, Toronto Audio Video & Electronics Show is the consumer electronics show in Toronto. 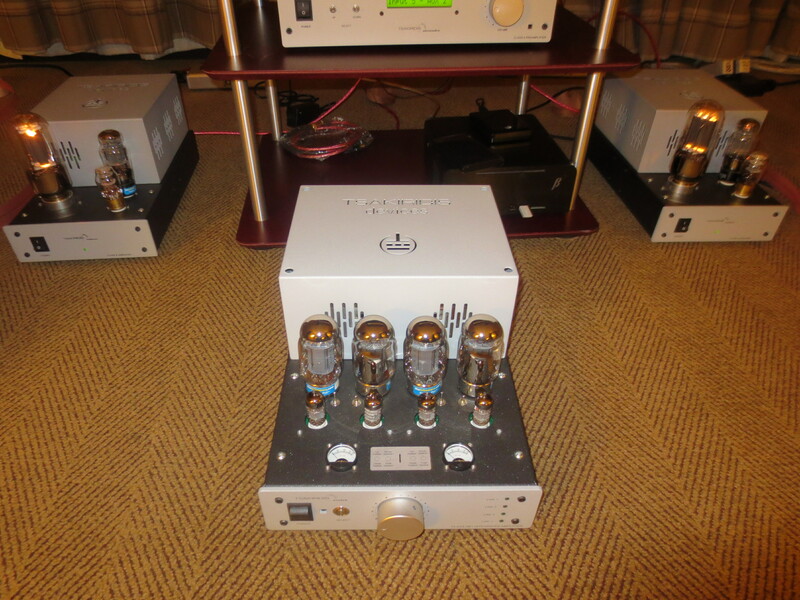 TAVES is co-run by Simon Au (of Audiyo) and Suave Kajko (of Canada Hi-fi and Guydster). To understand more about the show’s philosophy and direction, see the interview I did with Suave back in October. This year for the first time, the show was at the Sheraton Centre in downtown Toronto. Personally, I thought the venue was excellent. The location is central and in walking distance of many of the downtown core’s attractions. As far as layout, it was quite spread out, covering five areas on three floors – which meant more walking, of course. But as a result, the show didn’t seem overly crowded (I only attended on Friday, the first day). And audiophiles got a little exercise..not such a bad thing. The TAVES staff were super helpful, and really went the extra mile to ensure everyone found what they were looking for and had a good time. My hats off to the TAVES team for a job well done. 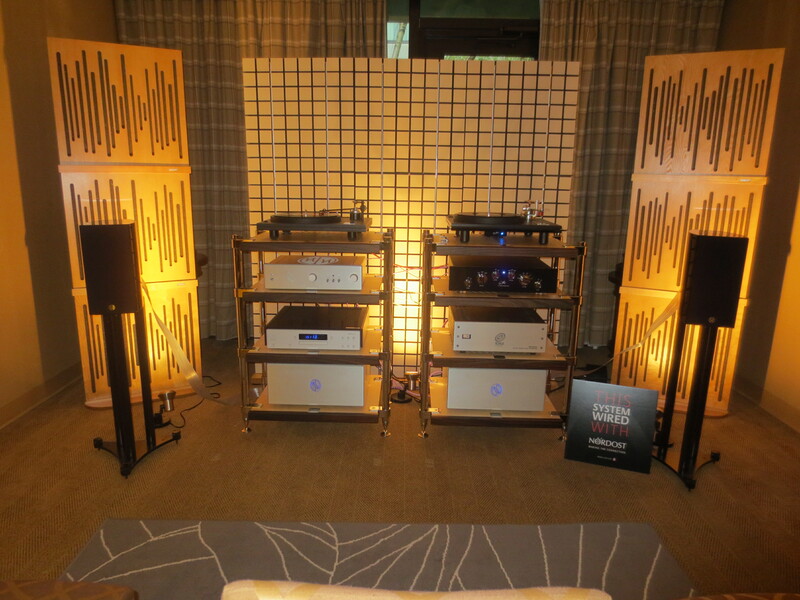 This is the first annual TAVES coverage report for Wall of Sound. I appreciate the effort it takes to set up and demonstrate two-channel audio at these shows. But, as I think readers here would expect, I’m only going to focus on the few rooms where I felt, for one reason or another, connected to the music. There were really four rooms like this, for me, and some “honourable mentions” (and I’m sure, others, that on a different day I might have enjoyed more). Following this article, Tim and I will also publish a back and forth banter on what we heard, saw, and liked (Tim was covering the show for 6moons, and we attended on different days, and didn’t meet up or discuss any of this). So, here we go. 1. Charisma Audio. Bernard Li (of Charisma Audio) and his daughter, manned this room, which was a joint effort between distributor Charisma Audio of Richmond Hill, Ontario, and one of its’ Toronto dealers, Update TV & Stereo. The system here was built around Modwright amps, Audio Exclusiv preamps from Germany, two Well-Tempered turntables, and System Audio monitors from Denmark. All backed by the truly lovely Vicoustic acoustic panels that Charisma also distributes and sells. As usual, Mr. Li had his analog setups working superbly. Unfortunately, the Pre-audio GL-1101 turntable didn’t arrive in time for TAVES, but the two Well-Tempered turntables acquitted themselves very well indeed. One WT was running the Charisma Audio MC-1 aluminum-bodied cartridge, which we reviewed a few months back. 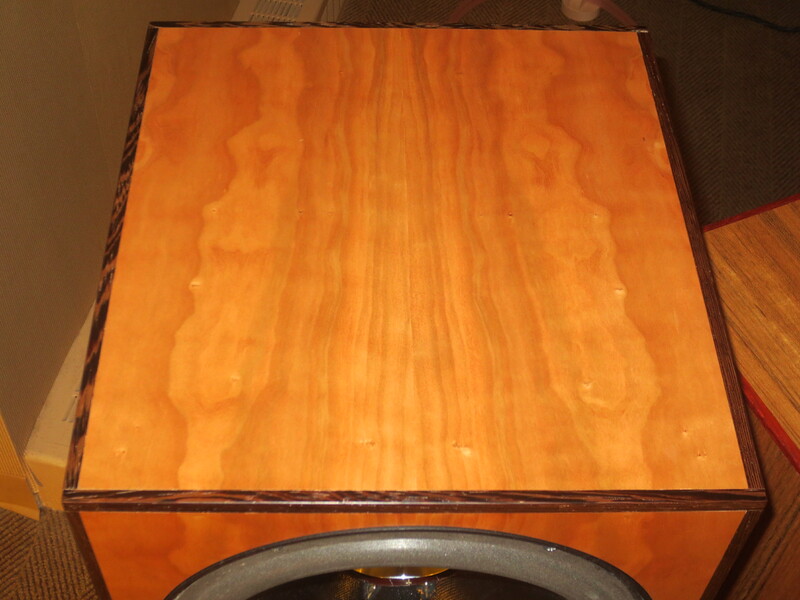 The other was running the brand-new Charisma Audio Reference 1, a wood-bodied MC. Both made great music, but the sounds coming from the Reference 1 were just out of this world. This system was both tonally rich, and pinpoint accurate. A neat trick. It also had pacing and rythym in spades. Based around a fairly small pair of SA speakers, it was still rich and satisfying – the lack of very deep bass didn’t detract from the listening experience. I asked Bernard to play John Zorn’s Mount Analogue CD that I had with me for reference, and I was pleased with what I heard. But after five minutes or less, other people had walked in and everyone (even me) was anxious to ensure that they heard this system in all its’ glory. Back to analog, please! 2. Devine Audio. Pronounced the same as “divine”, Brantford, Ontario’s Devine Audio is the brainchild of Rohan Amarasinghe, an audiophile and speaker builder of some renown – he makes and finishes the cabinets for two very well-known local high end speaker companies (and I do mean well-known, as in globally). I arrived at this room at a quiet moment, and being the sort who enjoys odd-looking speakers as much as the next guy, I was immediately drawn in. Meeting Rohan, I honestly had one of those strangely familiar moments. A kindred audio spirit, as it were. He welcomed me warmly, and humbly explained to me his quest to make an efficient, full-range speaker of his own design. A Canadian of Sri Lankan origin, from very nearby me, with a passion for audio design and development – now this is exactly the kind of story that we strive to share, here on Wall of Sound. 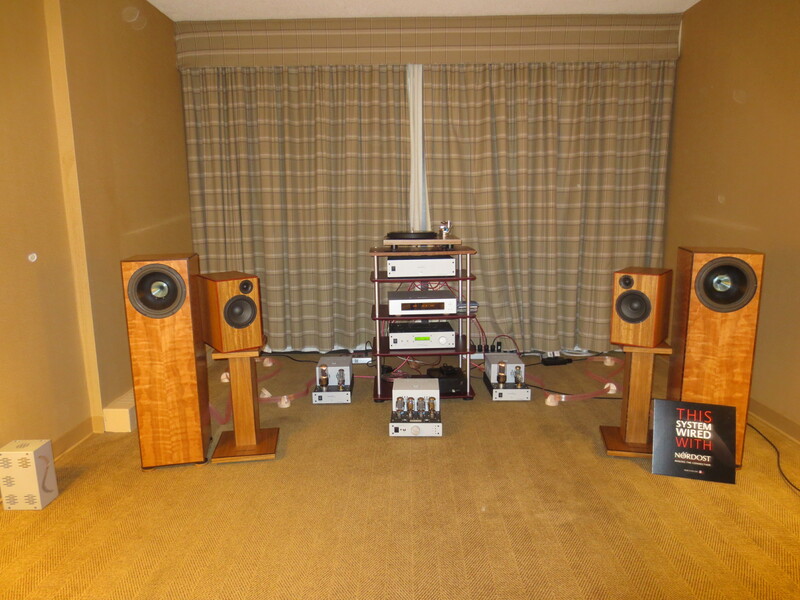 I want to note that the Devine room had the most modest setup that I encountered at TAVES; no room treatments, no paraphernilia, not even a real audio rack. Rohan used the hotel’s side table to house the electronics, and the sofa seemed to do a decent job of reigning in some of the stray room modes. Some might argue that more should have gone into the setup, but my feeling was that Rohan has invested his heart and soul into the loudspeakers, and wants to present them in a normal, domestic environment. The floorstanders you see pictured are 98dB sensitive and retail for $5,000 Cdn. Rohan suggested that if these were marketed by one of his commercial clients, they would be “in the $15-18k range”. 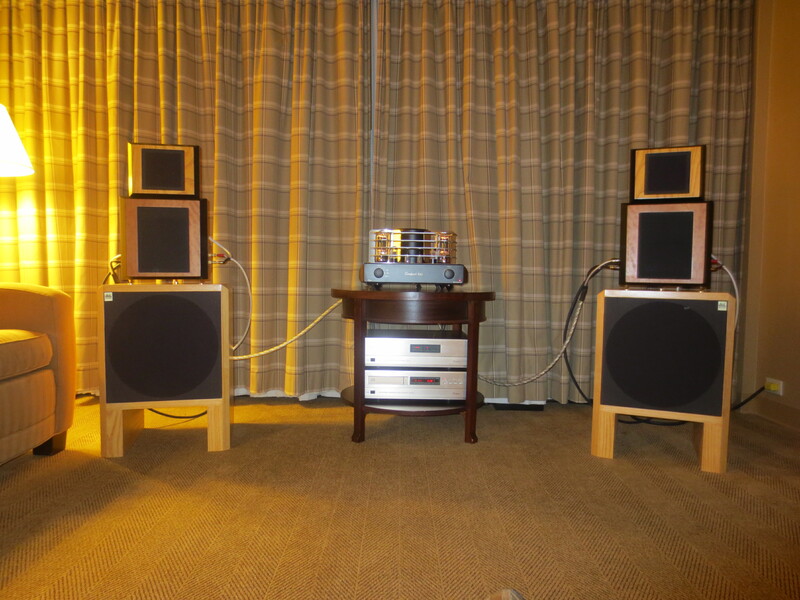 They were driven quite effortlessly by a Mastersound Compact 845 integrated amp, which was fed by a fairly ancient-looking two-box Accuphase digital player. I felt that the system may have suffered somewhat from this weak link (the Accuphase gear), but overall, the sound here was really very, very good. 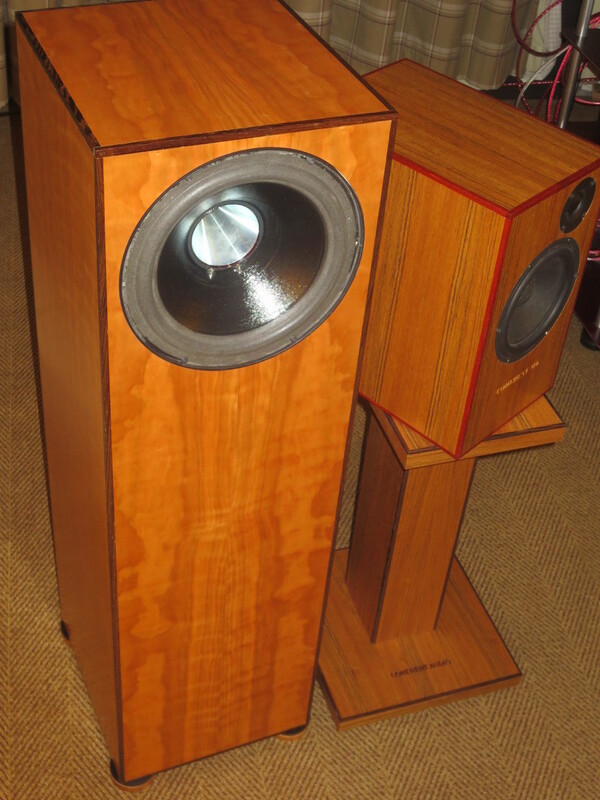 These Devine speakers were dynamic, with excellent crossover integration between the three drivers. The separation of instruments was uncanny, and tonally they sounded right. There was some breakup in the midband on the Zorn CD, and I had to back off on the gain setting. However, that recording is quite “hot”, and really, the peak distortion could have been a result of any number of factors. 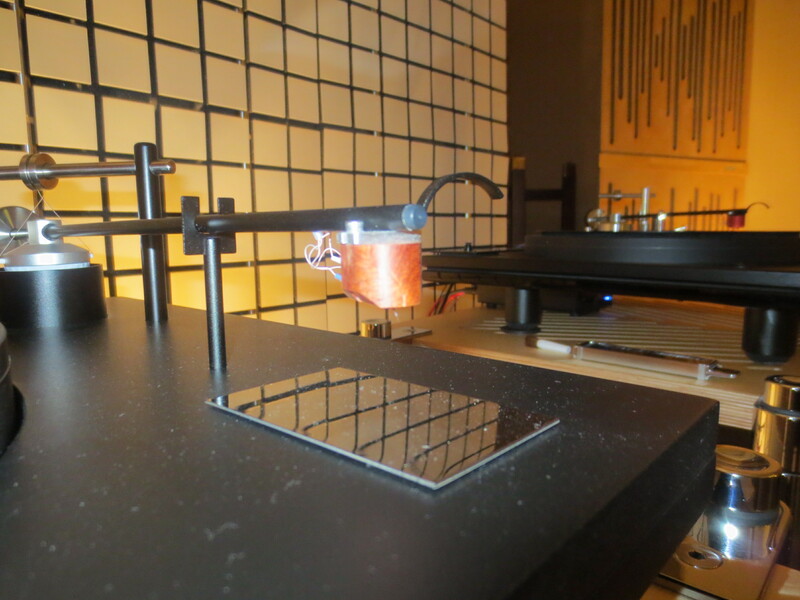 Rohan indicated that he is still, and constantly, tweaking and refining this speaker. 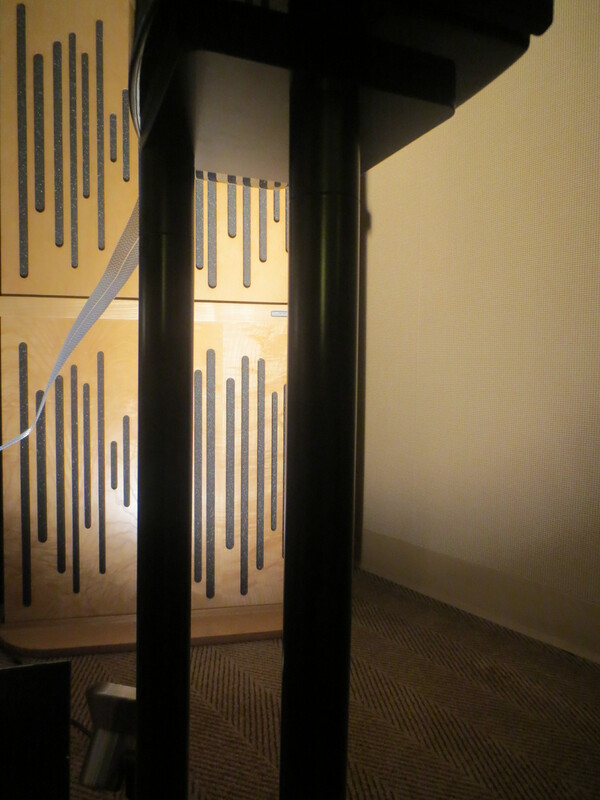 He also has a reference monitor, on its’ own stand, which uses a Volt full range driver. I am looking forward to reviewing both of these speakers in the near future. 3. Coherent Speakers. 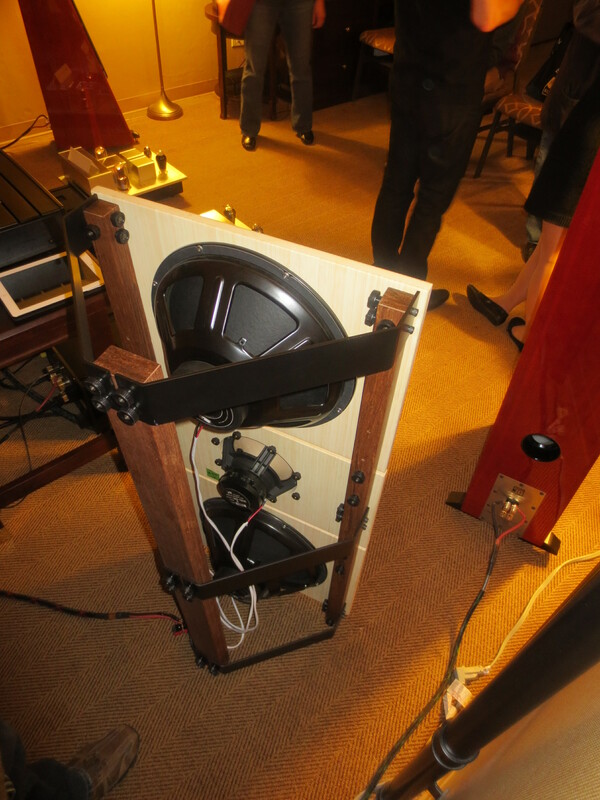 Another extraordinary room was the pairing of local builder Coherent Speakers, owned by Frank Fazzalari of Hamilton, Ontario, and Greece-based tube audio maker Tsakiridis Devices (who at this time are still in the process of clearing legal declarations for import to North American markets). Beautiful music was being made in this room, from the Coherent Model 10. 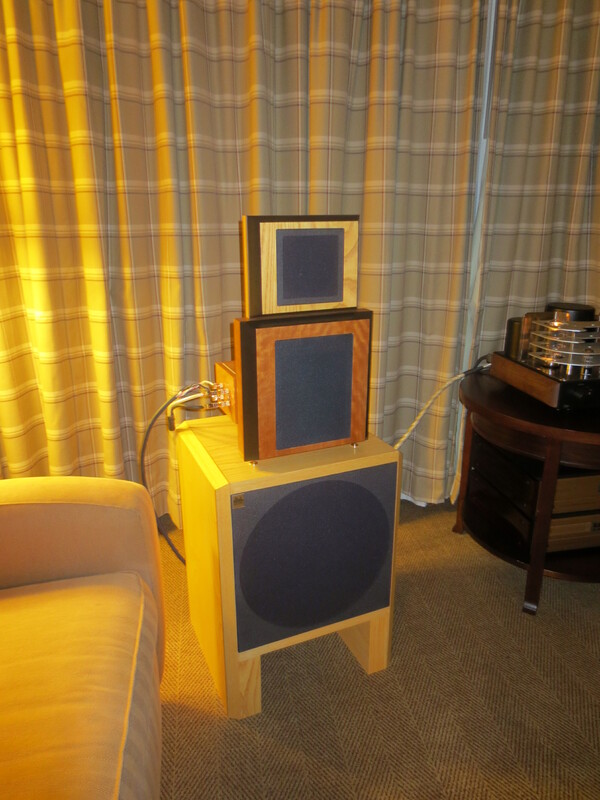 They also have a smaller Model 6 (shown), and a larger Model 15 which wasn’t present at TAVES. This room was quite busy, and as a result I don’t have many details to share, but these are full-range, sensitive designs, and Frank has also agreed to supplying us with a review sample in the days to come. I’m very much looking forward to hearing these speakers again. They appear to be very nicely made, and sounded fantastic to my ears. 4. Neat Acoustics & Naim Audio. Finally, two names that really need no introduction. 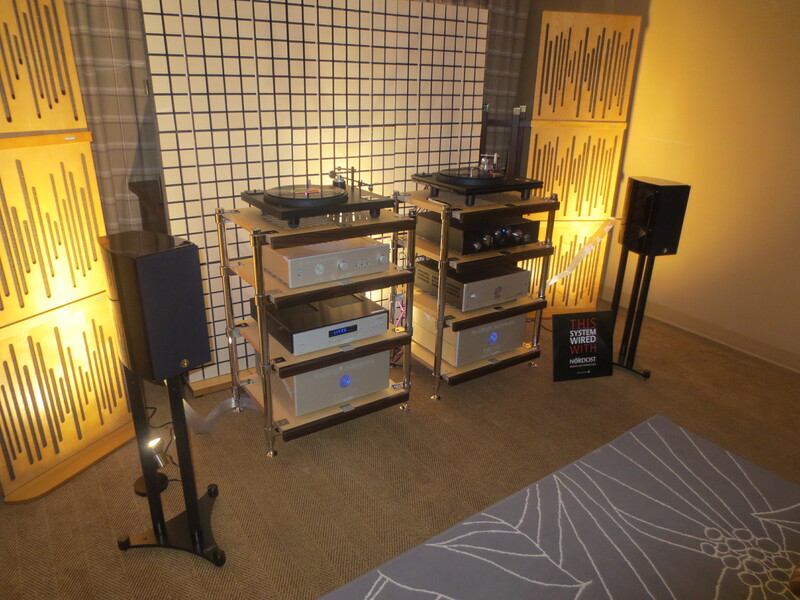 England’s Neat Acoustics and Naim Audio are both well known in audio circles around the globe. And with good reason. Naim has been a mainstay on the hi-fi scene for decades, being one of the first companies to employ modular design into their line of audio electronics. Neat Acoustics has also been around for many years, and has a reputation for value and performance. As far as I can recall, this was my first exposure to their speakers. And I was extremely impressed. 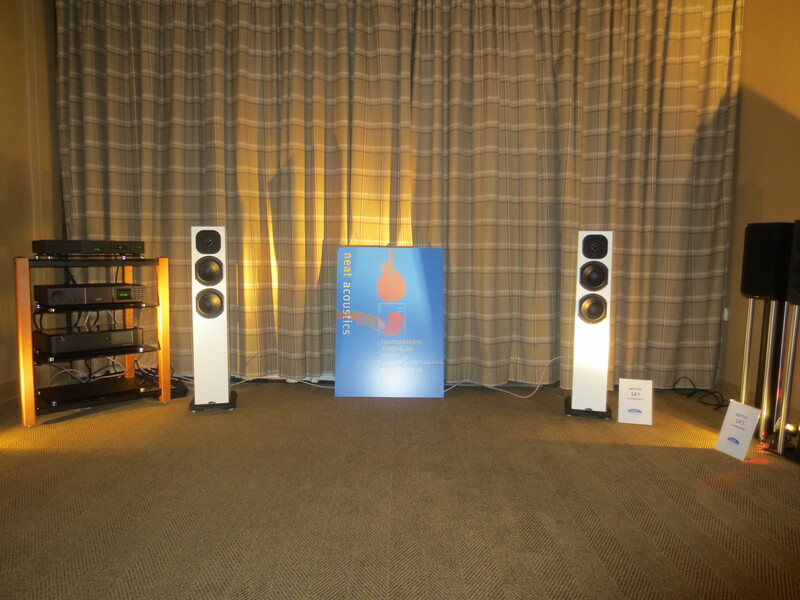 The Neat Motive SX1 on showcase is a floorstander with a small footprint, and a moderate price ($3500), and they were making big, big music at TAVES. This system was lightning fast, enveloping, and organic sounding. It just made me smile. Bob Surgeoner, managing director of Neat Acoustics, was on hand to explain his lineup, which ranges from the tiny IOTA on demo next door in the Kimbercan room, through the Motive SX range, and up to the costlier, Isobaric based Momentum range. 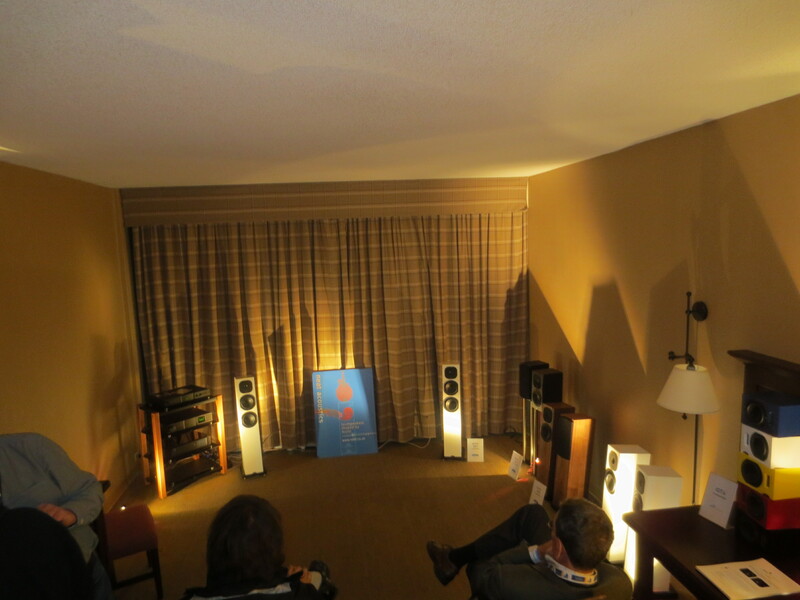 Naturally, this room was using “real-world” Naim electronics, e.g. 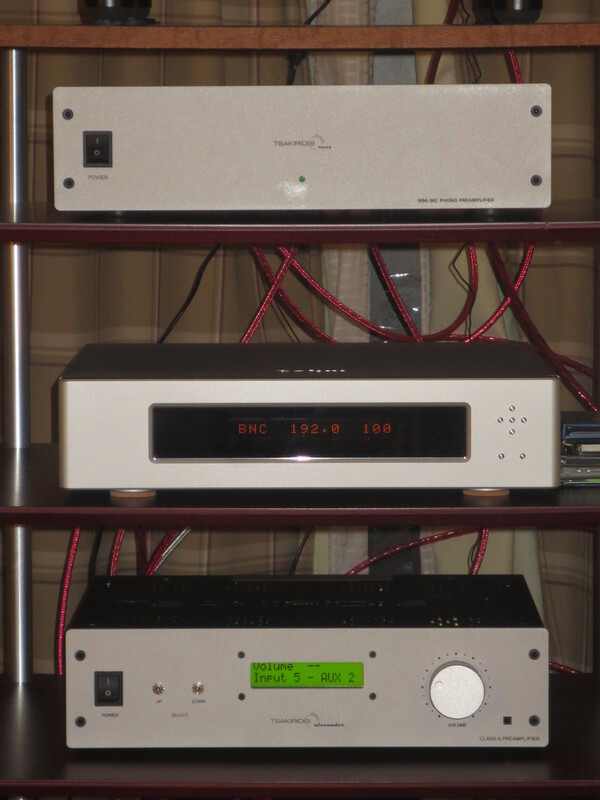 the Superuniti integrated amp (90wpc), and not the “Naim Statement” gear – the half-million dollar setup that was on show downstairs. 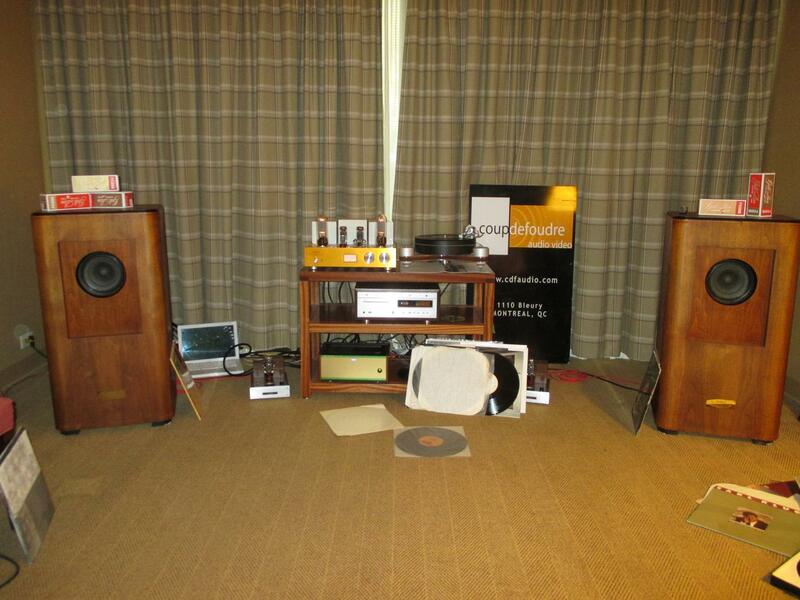 But these were some of the best sounds I heard at TAVES, if not the best. As a caveat, the music on tap was somewhat “audiophile”, from one of the famous Naim Sampler discs. Still, I made note and followed up with Don Rhule of Kimbercan, the Neat distributor, who suggested that the slightly smaller and less pricey Motive SX2 would make a fine candidate for review. I’m awaiting confirmation on the details, and eagerly hoping to spend more time with these excellent transducers. 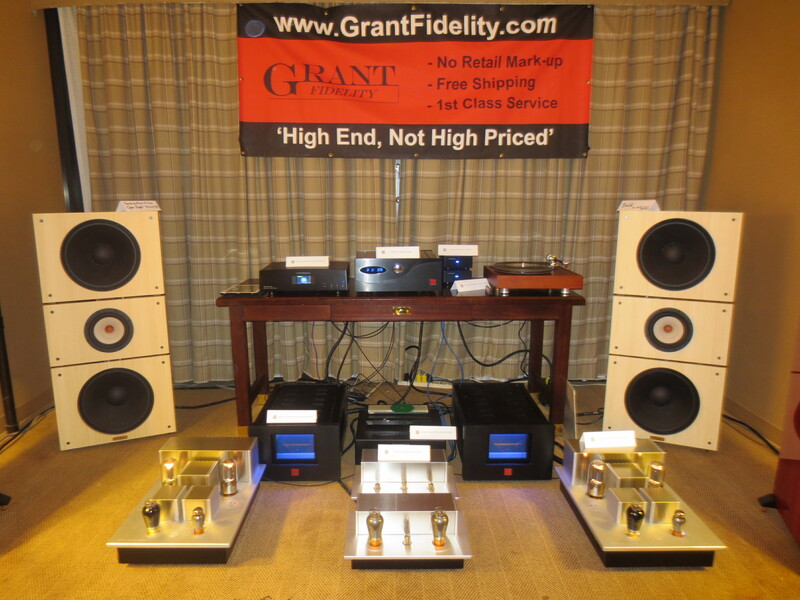 Grant Fidelity had a great presence at the show, featuring their own electronics, amps and preamps (and many tubes) from Psvane, a pair of monster Jungsen amps, and most interestingly, the PureAudioProject Trio15 TB – an open-baffle speaker system (kit) from Israel. Coup de Foudre, a Montreal retailer, had an excellent setup featuring Line Magnetic tube electronics and LM’s amazing 755i full-range speakers designed after the famous Western Electric 755a. 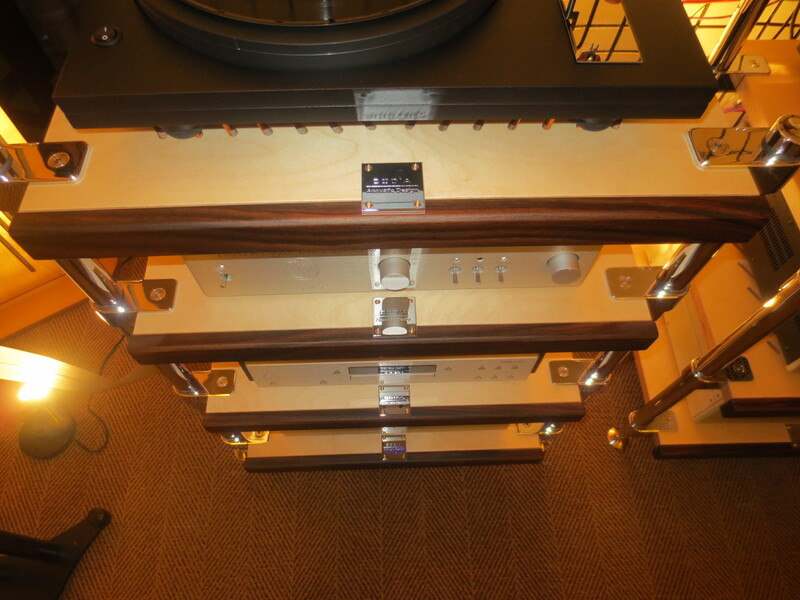 Crown Mountain Imports had a very musical system based on Kudos speakers and Norma Audio electronics. All of these will be discussed further in the “head to head” impressions article that Tim and I are working on.